The Talking Snowman is a Judy Bolton mystery co-written with Margaret Sutton! The Talking Snowman is now available in a limited-release collectors' paperback edition. Originally written over a decade ago, The Talking Snowman was conceived by Margaret Sutton and later jointly written with Linda Joy Singleton. This new Judy Bofton mystery takes place between The Invisible Chimes #3 and Seven Strange Clues #4, making it #3 1/2, bringing to life Judy's first Christmas in Farringdon. 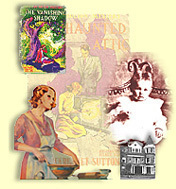 Biographies of Margaret Sutton and illustrator Pelagie Doane. A chronology of Judy's life, including the births, deaths, and significant adventures of all major characters. Details on the real life events and places that influenced each book. Decriptions and discussion of the artwork, editions and foreign editions of the series. A plan of Judy's garden, recipes from the series and much more! To order a copy, or check for availablility, contact Synsine Press at http://synsine.com. The Whispered Watchword is the newsletter of the Society of Phantom Friends. If you are an adult who loves Nancy Drew, Judy Bolton and Trixie Belden Connie Blair, Kay Tracey, Beany Malone and other girls' series...YOU ARE NOT ALONE! Join The Society of Phantom Friends, an international fellowship of girls' series book collectors. Read about series past and present in our official monthly 30 page newsletter, The Whispered Watchword which includes a wide variety of articles on all aspects of girls series collecting, past and present, written by fellow collectors. Sales lists and want lists are published at a small charge. Yearly membership includes 10 newsletter issues plus the opportunity to attend our annual convention and many regional get-togethers. Please make checks payable to Kate Emburg. All 38 Judy Bolton Titles Available from Applewood books! All 38 of the Judy Bolton Mysteries by Margaret Sutton are now available in paperback from Applewood books. They were laser copied from the first editions of each book, courtesy of the author's family. Look for them at your favorite bookstore! You can also purchase them on Amazon.com. Aeonian Press sponsored by dealer Jim Towey, has reprinted a limited copies of the later numbered, hard-to-find Judy Bolton books including The Secret of the Sand Castle and The Search for the Glowing Hand.